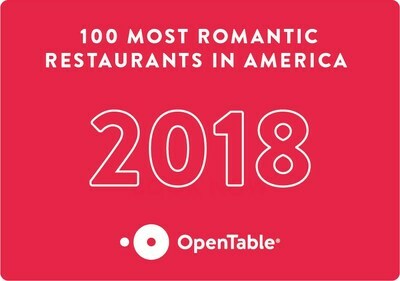 OpenTable Diner Reviews Reveal 100 Most Romantic Restaurants in America | OpenTable, Inc.
SAN FRANCISCO, Feb. 6, 2018 /PRNewswire/ -- As we approach the year's biggest holiday for dining out with loved ones, OpenTable, the world's leading provider of online restaurant reservations and part of The Priceline Group (NASDAQ: PCLN), today unveiled the 100 Most Romantic Restaurants in America for 2018. These awards reflect the combined opinions of more than 12 million restaurant reviews submitted by verified OpenTable diners for more than 26,000 restaurants in all 50 states and Washington, D.C.
Highlighting winners in cities both large and small, the complete list showcases a diverse group of restaurants in 32 states and includes standouts, such as The Inn at Little Washington in Washington, VA, River Cafe in Brooklyn, NY and Stonehouse at San Ysidro Ranch in Santa Barbara, CA.North Carolina, Ohio and Virginia are tied at the top of the list, each boasting eight winning restaurants, followed by Florida with seven, New Jersey and Texas with six, New York, Tennessee and Washington with five and Oklahoma with four. Alabama, California, Colorado, Maryland, Pennsylvania and South Carolina all claim three winners while Georgia, Massachusetts, Missouri, Nevada, Oregon and Rhode Island each have two. Proving that the right atmosphere can help set the mood, this list features an assortment of intimate restaurants located on charming properties that provide the perfect backdrop for the occasion. While American flavors dominate in terms of cuisine at these romantic hot-spots - steakhouses, French and Italian fares are also popular. "Valentine's Day is all about sharing food with loved ones. Whether enjoyed with a significant other, a friend, or with family, a delicious meal accompanied by elegant ambiance and superb service is the perfect way to celebrate," said Caroline Potter, OpenTable Chief Dining Officer. "Be it February 14th or any time you want to connect with someone in your life, this year's winning restaurants have created the ideal spots for intimate dining experiences." The list of the 100 Most Romantic Restaurants in America is generated solely from more than 12 million verified OpenTable diner reviews collected between December 1, 2016 and November 30, 2017. All restaurants with a minimum "overall" score and number of qualifying reviews were included for consideration. Qualifying restaurants were then scored and sorted according to the percentage of reviews for which "romantic" was selected as a special feature. Diners can also read more about the 100 Most Romantic Restaurants in America as well as our #ValenDinesDay Valentine's Day giveaway by visiting the OpenTable blog.